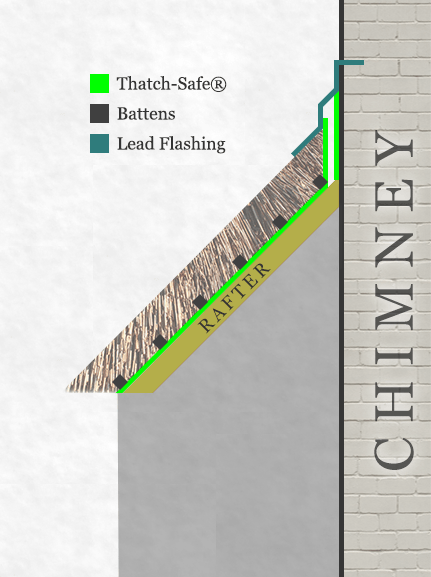 As we can see from the diagram, the Thatch-Safe® sits on the rafters and under the thatch. This provides a barrier between the thatch and the roof structure with no counter battening required due to the breathability of Thatch-Safe®. Thatch-Safe® is flexible so it is easy to fit around windows and in valleys. It can also be double wrapped around the chimney – reducing the risk of heat transfer from the chimney. Joints are overlapped and fixed with the usual battens required for the thatch to be fixed to, so it is a simple and effective solution, easily applied. To see the benefits of adding the Magma Firestop to this please see Thatch-Safe® Model Plus. For more information on Magma Firestop please contact us, we are happy to help with planning, fire retardant or insulation requirements for your thatched roof.